Home » States » NORTH EAST » Arunachal Pradesh » After Uttarakhand, Will Arunachal & Sikkim Be Next? After Uttarakhand, Will Arunachal & Sikkim Be Next? I read this article and found it very interesting, thought it might be something for you. The article is called After Uttarakhand, Will Arunachal & Sikkim Be Next? and is located at https://archive.indiaspend.com/investigations/after-uttarakhand-will-arunachal-sikkim-be-next-54548. India’s northern state of Uttarakhand is struggling in the aftermath of flash floods which caused massive destruction of life and property. At last count, over 500 have died. The tragedy has also turned the spotlight on the unmitigated construction activity in the environmentally sensitive hill areas, notably the vast number of hydel power projects. India’s federal auditor, the Comptroller & Auditor General (CAG), in a report submitted four years ago warned Uttarakhand as well as the Central Government of potential hazards arising from the 42 hydropower projects in the state as well as some 200 under construction. But Uttarakhand is not alone. India’s earthquake-sensitive, north-eastern hill states like Arunachal Pradesh and Sikkim are also seeing a frenzied construction of new power plants. Most of this capacity is meant to serve consumers elsewhere because the states are already meeting most of their own demand. This report does not delve into the environmental assessment impact of these additional power plants. And yet, the scale of projects planned and underway is staggering. For instance, the Arunachal Pradesh Government had, as of March 2013, signed memorandum of agreements (MOAs) for 153 hydel projects adding up to a whopping 43,118 MW. This is almost 19% of India’s total installed capacity of 225,133 MW! The good news perhaps is that most of these projects are yet to take off. Sikkim as per the latest list submitted recently by the Government in High Court, has 26 live hydro power projects with a total revised capacity of 4190.50 MW. This included 570 MW commissioned by NHPC and an additional 730 MW by the public sector National Hydroelectric Power Corporation (NHPC) under construction. The large number of power projects on the runway does not in itself mean that an Uttarakhand-like disaster will strike but warnings have been sounded for a while, mostly by locals. There have been a fair amount of media reports on Arunachal’s `hydel gate’ too but fewer have focussed on the potential environmental hazards. Arunachal for instance lies in Seismic Zone V, or very ‘high damage risk zone’. In contrast to the massive line-up, current power demand in the two states stands at just 589 MW for Arunachal Pradesh and 409 MW for Sikkim. Incidentally, total installed capacity in the north east of India is 2,885 MW while peak demand is 1,899 MW. Actual demand met stands at 1,718 MW right now, leaving a deficit of 9.5% (181MW). Arunachal Pradesh currently generates around 44o MW of power. Of this, 35.19 MW comes from 63 micro/mini/small hydro electric plants (HEPs) while 405 MW comes from a single power project, run by the North Eastern Electric Power Corporation (NEEPCO), a public sector unit. Projects worth another 690 MW are under construction. The NEEPCO is building one 600 MW plant while the state government is building 72 mini projects with a combined output of 91.9 MW. Sikkim generates around 610 MW of electricity; of this 40.70 MW comes from the state government while the balance 570 MW comes from the NHPC. There are approximately 10 projects at various levels of construction in Sikkim which would potentially add 1,000 MW capacity. Projects include Gati’s 97 MW project and Jorethang’s 97MW. Assuming a cost of Rs 7 crore per MW, the total cost of these projects would be at least Rs 7,000 crore. There is concern that these ambitious plans might be good to meet energy deficits but dangerous environmentally. While this report is not delving into environmental assessment issues, it’s interesting to note that many projects have gone to developers with no prior experience. A fact pointed out in recent media reports as well. They include Gati, a cargo & logistics firm, Athena Energy Ventures, which has had some construction experience but one leg of the trail ends up at the door of a finance company – Karvy Financial Services. Similarly, Dans Energy was a finance company before it also joined the energy race in the north-east state. Second, it is alleged that the Environment Impact Analysis (EIA) studies prepared have lacked vital inputs like seismological data and geological formation studies. Moreover, huge tracts of forest lands have been diverted for non-forest use, involving felling of thousands of trees. In Himachal Pradesh, to use a concurrent example, 78 square kilometres of forest were engulfed by hydroprojects. The compensatory afforestation programme by project developers is often faulty and inadequate. It is also felt that the environmental issues are not getting the attention they deserve from the Ministry of Environment and Forests (MoEF). For instance, the ministry has set the minimum distance between two dams at 1 km; reason being that the 1 km distance is the bare minimum between dams on the same river or tributary needed to preserve aquatic life. There are charges of developers manipulating river flow data, discharge of water data, flouting norms on deposition of muck from drilling and blasting as well as felling of trees and not fulfilling the compensatory plantation. There have been wide scale protests across the Himalayas against these practices. In Sikkim, organisations like the Sikkim Bhutia Lepcha Apex Committee (Siblac) and the Affected Citizens of Teesta have been protesting the hydro power projects. The CAG in a report on the power projects, said: “The terms of the High Powered Committee-endorsed hydro power policy are loaded in favour of the IPPs (Independent Power Producers). Sikkim charged an absurdly low upfront premium of Rs 10,000 per MW of installed capacity towards non-refundable processing fee while states like Himachal Pradesh, Arunachal and Uttarakhand were demanding and getting huge up-front premiums from private hydropower developers. So, why are the states going hell for leather in setting up these projects, despite the potential environmental hazards? Revenue from power seems to be a key consideration. Arunachal, for instance, has collected substantial sums as processing fee and upfront premium from the project developers. There have been multiple reports of corruption as well. And there are other concerns. Questions are being raised about the state’s authority in giving away land for any project. In Arunachal, all land rights are with the tribal communities. The same applies to Sikkim, under article 371f, as most of the land is tribal land with no right to purchase, sell or lease being vested with non-tribals. As this report started by saying, projects signed up do not mean executed. As it turned out. Most Arunachal projects were signed off between 2006 and 2009, a boom period of sorts. This trend is similar to excesses in other resource-led industries like coal, in the same period. 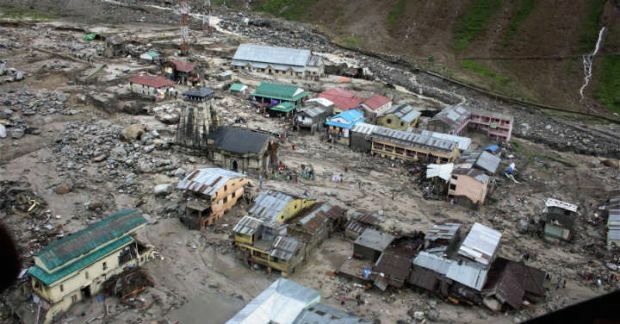 Be that as it may, the Uttarakhand disaster should surely serve as a strong warning sign to any environmentally sensitive infrastructure projects, particularly in the virgin hill states of India. It has been noticed that your reporter has collected lots of data from various sources to proof his doubt, but I am more than sure, has not read the details of geography, in his school life. What happened in UK in the recent past, is due to Cloud Burst. That is a natural phenomena. In a particular place, when cloud amassed in 2 or more layers, it may burst at any time resulting devastating flow of water. Human have no control on it. It is, therefore, neither related with construction of Hydel project, nor with felling of trees. Of course, the trees may prevent silt, to flow in the river. That is also may not be correct, as the catchment area of Amazon & Tista (the top 2 silt bearing rivers) are totally covered with forest. NEW DELHI: Hydel power generation from the projects affected by rains and floods in Uttarakhand and Himachal Pradesh has been restored, according to an official. Due to heavy landslides many Hydro Electric Projects had stopped work on account of high silt content in water. “No project was stalled due to floods. Our’s is a storage project and the catchment area is big so there wasn’t so much problem,” THDC India official said. Tehri reservoir recorded the rise of 25 meters within 48 hours of rainfall on 16-17 June, the statement said. On June 16, Alaknanada and Bhagirathi had a combined flow of around 13,000 cumecs at Haridwar out of which only 500 cumecs of Bhagirathi water was released from Tehri Dam Reservoir. “In case the whole of the water inflow of Bhagirathi would have been released from the Tehri Reservoir it could have caused an additional rise in the water level,” it added. SJVNL, which operates Nathpa Jhakri Hydroelectric Station of 1,500 MW capacity, was stalled due to higher silt level on June 18-19. “This situation was mainly due to higher silt levels,” SJVNL official said. State-run NHPC’s Dhauliganga project in Uttarakhand was also affected. However, the company said that normalcy has been restored at the site. No .. I don’t think so! The last time I visited Uttarakand was way back in 2006 and you must only go there to realise what we are doing building those Hydel Plants on the fragile mountains !! In event even last year we had a grim situation in Rudraparag, it was an indicator which no one pay heed too !! Further, you do not have the kind of tourist visiting this region as compared to those visiting char dham in Uttarakhand !